BELLVILLE — The 2018 All-Northwest District football teams have been announced and the 12-1 Clear Fork Colts have a lot of players on the Division IV team. Hunter Tollison is a member of the first-team offensive line and Trevon Trammell is a first-team running back. Tollison is also the co-linemen of the year, along with Blake Kanoor, of St. Mary’s Memorial High School. Clear Fork’s Michel Chillemi was named to the first-team defense as a lineman and Jared Schaefer was named to the first team defensive backfield. Caden Flynn (end) and James Watt (line) were named to the second team offense, along with Clear Fork kicker Gabe Blauser. The second team defense includes Jay Swainhart (lineman). 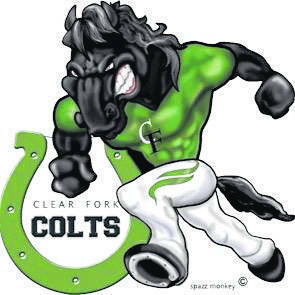 And named to the honorable mention team was the Colts’ Brennan South. Ends- Isaiah Alsip, Galion, 6-1, 175, jr.; Jayden Cornell, Kenton, 6-3, 195, so. ; Uriah Schwemley, Shelby, 6-3, 200, sr.
Linemen- Mitch Seewar, St. Marys Memorial, 6-1, 230, sr.; Ian Young, St. Marys Memorial, 5-10, 200, sr.; Morgan Mallory, Port Clinton, 6-3, 320, sr.; Hunter Tollison, Bellville Clear Fork, 6-2, 295, sr.; Nick Amstutz, Shelby, 6-4, 285, sr.
Running backs- Trevon Trammell, Bellville Clear Fork, 6-0, 185, sr.; Nate Place, Van Wert, 6-2, 185, sr.
Quarterbacks- Elias Middleton, Galion, 6-0, 165, sr.; Jaron Sharp, Kenton, 6-3, 200, sr.
Kicker- Gabe Vandever, St. Marys Memorial, 5-11, 175, sr.
Linemen- Blake Kanorr, St. Marys Memorial, 6-4, 265, jr.; Michael Chillemi, Bellville Clear Fork, 6-2, 260, sr.; Mitchell Pittman, Ontario, 5-9, 185, sr.; Trevor Rodriguez, Wauseon, 6-2, 230, sr.; Keagon Hammons, Van Wert, 6-0, 190, jr.; Alex Kuhl, Huron, 6-0, 260, sr.
Linebackers- Eddie Fowler, St. Marys Memorial, 5-10, 170, sr.; Noah Creed, Ontario, 5-11, 185, sr.; Angel Granados, Napoleon, 5-7, 154, sr.; Jack Howey, Bellevue, 6-1, 195, jr. Defensive backs- Sean Perry, St. Marys Memorial, 5-10, 180, sr.; Carter Ballweg, St. Marys Memorial, 6-1, 175, sr.; Jared Schaefer, Bellville Clear Fork, 6-2, 190, sr.; Casey Scroggins, Huron, 5-11, 165, sr.
Punter- Joey Shema, Wauseon, 6-0, 185, sr.
Ends– Caden Flynn, Bellville Clear Fork, 5-11, 160, sr.; Landon Rush, Kenton, 6-3, 195, so. ; Gavin Sparling, Bellevue, 6-5, 195, sr.
Linemen- Nick Myers, St. Marys Memorial, 5-11, 265, sr.; James Watt, Bellville Clear Fork, 6-0, 250, sr.; Cody Butler, Napoleon, 5-11, 258, sr.
Running backs- Cooper Stine, Port Clinton, 5-9, 205, jr.; Jarrett Gerdeman, Napoleon, 5-9, 180, so. Quarterbacks– McGwire Albert, Shelby, 6-5, 200, jr.; Nate Miller, Bryan, 6-1, 193, jr.
Kicker- Gabe Baluser, Bellville Clear Fork, 6-0, 165, jr.
Linemen- Braden Weitholter, St. Marys Memorial, 6-4, 260, sr.; Gunar Zink, Port Clinton, 6-4, 215, sr.; Jay Swainhart, Bellville Clear Fork, 5-10, 195, sr.; Matt Herold, Bryan, 6-3, 190, sr.; Joey Schaufelberger, Van Wert, 6-5, 230, sr.; Noah Eikenbary, Kenton, 6-0, 220, jr.
Linebackers- Max Brenner, Port Clinton, 6-0, 200, sr.; Marek Albert, Shelby, 6-2, 215, so. ; Alex Potvin, Bryan, 5-11, 184, sr.; Parker Conrad, Van Wert, 6-0, 185, jr.. Defensive backs- Mitch Kruse, Napoleon, 6-0, 182, sr.; Noah Tester, Wauseon, 5-11, 158, jr.; Jalen McCracken, Van Wert, 5-10, 165, sr.; Dalton Hay, Bellevue, 5-8, 160, sr.
Punter- Marshall Shepherd, Shelby, 5-11, 165, fr.